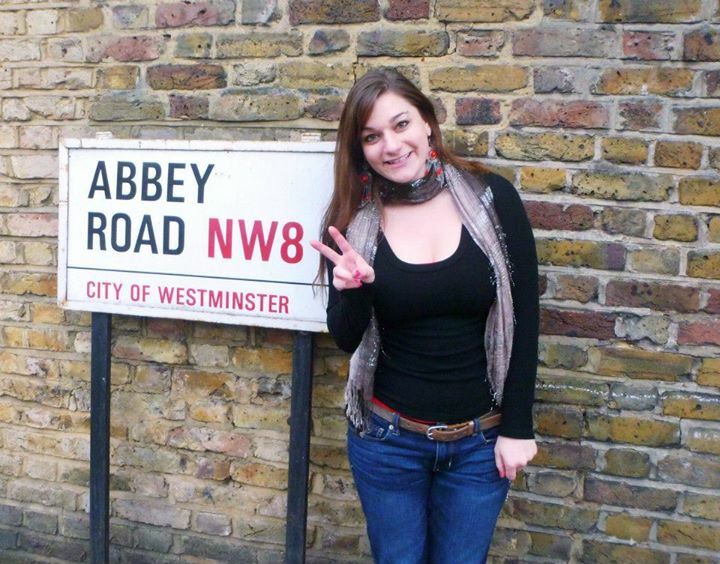 Leah Zarra posing in front of a sign for the famous Abbey Road. “I just loved being so independent and being totally immersed in another city,” says Leah Zarra, 22, a Texas native and Drew University graduate. 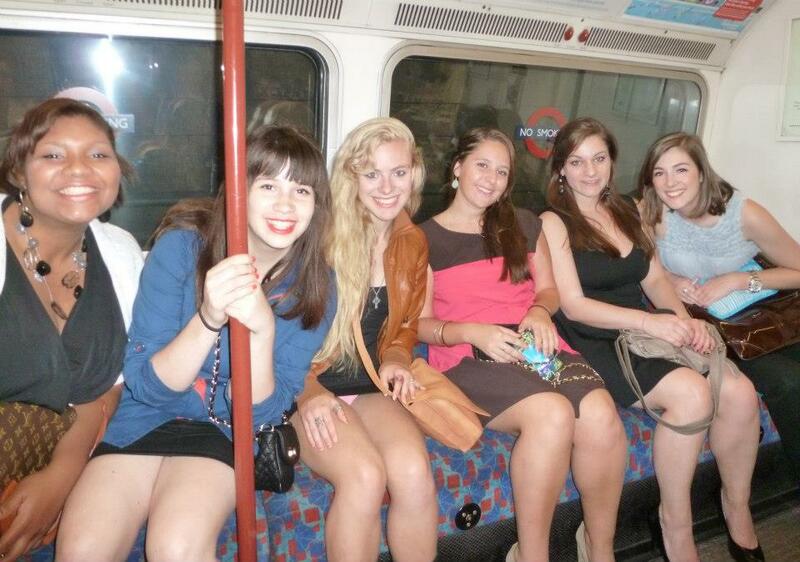 According to Zarra, the full semester trip to London cost the same amount as a regular, on-campus semester. The trip included: tuition, housing in a flat with other people from her college, and a 2-zone Oyster card—similar to a Metrocard, allowing Zarra unlimited access to the Tube (subway) within specified zones. When it came to financial resources to help fund her trip, Zarra had it covered. “I had an annual Dean’s award scholarship all through college, so this carried over to my semester abroad,” she explains. Zarra was able to take classes such as London Literature, British Political Drama, Modern British History and a required colloquium course. She earned 16 credits studying abroad—more credits than she would have earned in one semester staying on campus in the States. When it came to saving money while abroad, Zarra made sure to budget wisely. Sometimes students take out some loans to study abroad and Zarra believes it’s absolutely worth it. 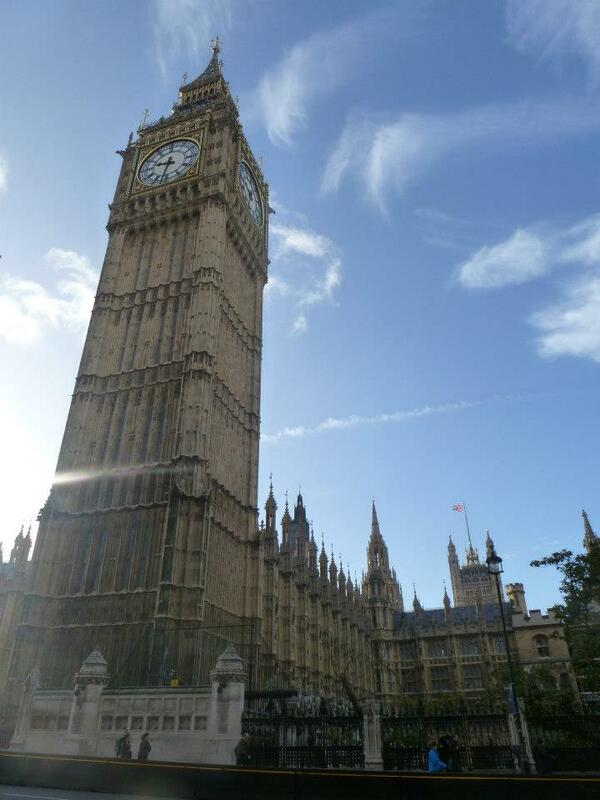 The famous Big Ben and Westminster Abbey. One of the many photos Zarra took while on her trip. #tbt (noun) – A hashtag frequently used to brag on social media about past travel adventures. However, Instagram-ing your “Throwback Thursday” pictures isn’t the only way you can document your study abroad adventures—though it is a popular one. Journaling is another inexpensive way to preserve your trip memories without breaking the bank. It can be difficult to have the discipline to write in a journal every day, but in doing so you’ll have something to look back on for years to come. The journal that I kept during my study abroad program in China. The cover is decorated with stickers and ticket stubs that I collected during my month-long adventure. Journaling can be an intimate experience, but for those looking for a more public outlet, social media is the way to go. Many travelers hoping to update friends and family overseas may want to consider creating an Instagram account. It’s free, works through WiFi and is a quick and easy way to document the highlights of your travels. Some travelers do not understand the need to take frequent photographs, however past study abroad students, like Kimberly Rogers, 21, disagree. 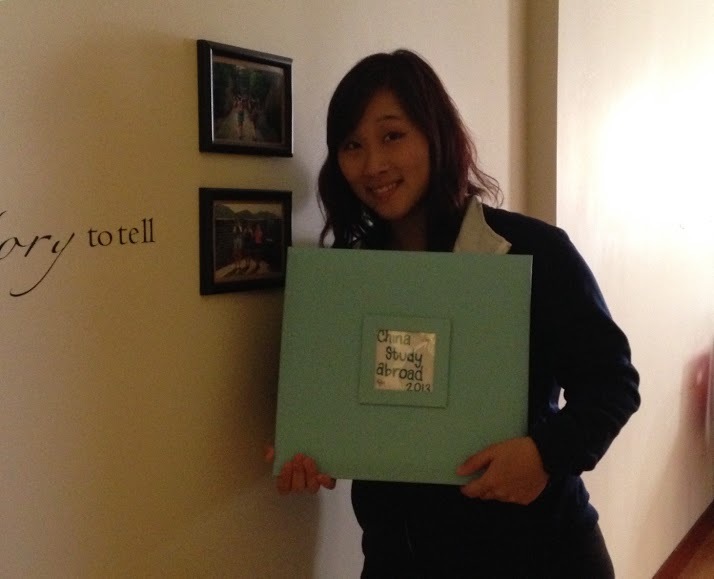 Kimberly Rogers holding the scrapbook she made after her study abroad trip to China. With more and more advances in technology every year, the amount of photos we can take and store is growing. Many of these photos get mindlessly uploaded to websites like Facebook and Flicker without a second glance, but the more creative you are with your photos the more memorable your trip will be. 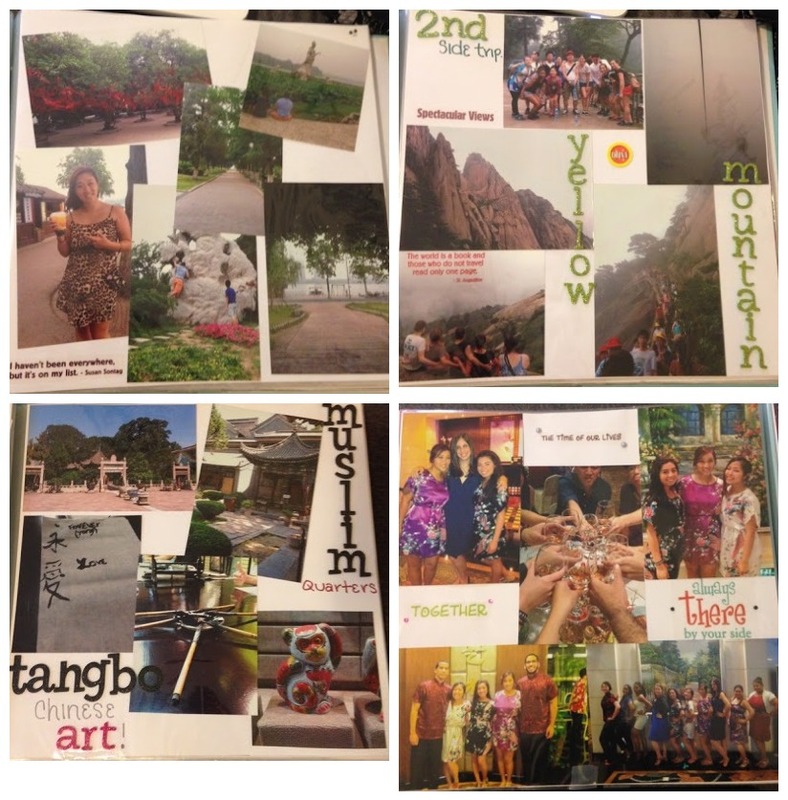 Scrapbooking, a widely practiced pastime in the United States, is a useful tool for preserving study abroad memories. Rogers, who frequently used Instagram during her trip to China, also created a scrapbook upon her return home. “I think it’s really important to document my travels,” she says, displaying her China scrapbook. Four pages from Rogers’ China scrapbook. The scrapbook that she created contains photographs of her friends, landmarks and other memories of her trip. She bought stickers that went along with the China theme and decorative paper to make the pictures pop. Some places to go for cheap deals on scrapbooking supplies are stores like Target, Amazing Savings and Michaels. We talk a lot about the function of fashion in our lives but we don’t spend enough time breaking down the genius and centrality of its artistry and design to its success as an art form. Fashion, to survive, is meant to be interesting. Just as fashion is meant to be personal and therefore paces its market choices around the general taste of people, fashion also has to present new ideas that people normally wouldn’t go for. In this sense, fashion plays on the dichotomy of pushing tastes to their limits while embracing the old and traditional way of things. The evolution of the house of Chanel through the decades is a perfect illustration of melding a long-established house aesthetic with experimental ideas yielding interesting results. Coco Chanel’s was known for her black and white polished style but that can get boring very easily. The question then becomes; how does her successor Karl Lagerfeld keep Chanel at the top of the game? 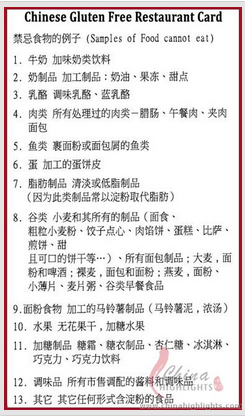 Firstly, he had to get a perfect understanding of the urban young adult and its social importance. Because as much as Chanel caters to the society matrons and their Emily Post sensibilities, they want to dress the young socialites who star in rock-n-roll videos (when that was a cool thing to do) and the ones with a million plus followers on Instagram who are so famous that they get personal nicknames from followers. But there is a reason why Giorgio Armani is the complete opposite in terms of exploring avant-garde themes yet is so incredible successful. He has something equally as dull as it is interesting going on for him — he’s predictable. People trust his work because it doesn’t (and didn’t) evolve from its core aesthetic. His color scheme is instantly recognizable. He cuts his jackets the same way every time so when you want an Armani jacket, you know what you want. And next year it might come in a different color or shinier texture, but it’s classically Armani. That’s an interesting concept too, in fashion, creating a classic. And it’s probably harder to create a classic fashion garment than to push boundaries with new collections every season. The person who creates a classic piece had to rework a single theme over and over again in new ways and still make people want to buy it even though it’s nothing new. When Marc Jacobs was at Louis Vuitton, he shocked people. You wanted to sit at the Vuitton show because you never knew in what new ways you’d be thrilled. And the clothes themselves were thrilling but they seemed to belong more on the runway than on the street. Fashion is the playground where two divergent ideas both lend an equally important lens into what makes it so interesting. Some designers think the traditional is sterile. And some designers think that true artistry is real focus into craftsmanship and the mastery haute couture which hold traditional values about dressmaking. But there is no question that this artform continues to be interesting. The final product always stuns. I can’t help it. Wherever I go I like to take mementoes with me. My best friend calls me the Souvenir Kleptomaniac. If there’s a free gift or college discounts to be had, I’m there. At restaurants I save the little business cards and menus and circle what I ate. I keep receipts from purchases in other countries just because there’s a different language on them. I’m a sucker for nostalgia and remembering my trip in every detail possible is important to me. Although people aren’t generally this extreme, the act of bringing home a keepsake is usually one that people follow. The most important thing about souvenir shopping is getting the most for your money without going bankrupt. As discussed earlier, sometimes it’s hard to pack everything you need in one suitcase. However, make sure you leave some extra space in it so you have room to bring things back. You don’t want to have to buy an extra piece of luggage to fit everything you want to bring home. Extra luggage means more plane space, means more money out of your pocket. If you’re going to a country that makes a lot of money off of tourism chances are the people there are waiting for you: and they’re prepared. They want your business and they want you to spend your money on keychains and postcards and bottle openers with funny sayings on them. Don’t feel the need to do your entire souvenir shopping in one day at the same place. 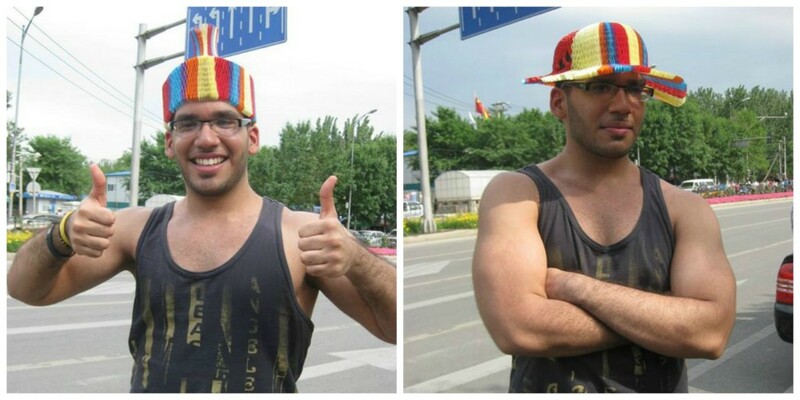 My friend bought a hat from a vendor in China for 25¥ ($5!) that ripped only seconds after purchasing it. Do not buy souvenirs at the airport. Those T-shirts that say I HEART [insert country’s name here] aren’t going anywhere. You will see them wherever you go throughout the country, and will probably get a better deal on them in other stores than in the first one you see. And don’t be ashamed of doing it! The locals want your money, and chances are the initial price they are asking for that miniature sculpture of that famous landmark is a lot higher than they expect you to pay. Haggle with vendors for a better deal. If you are uncomfortable with the asking price—walk away! You’re not obligated to buy anything, and many times walking away will encourage vendors to immediately drop their asking price. 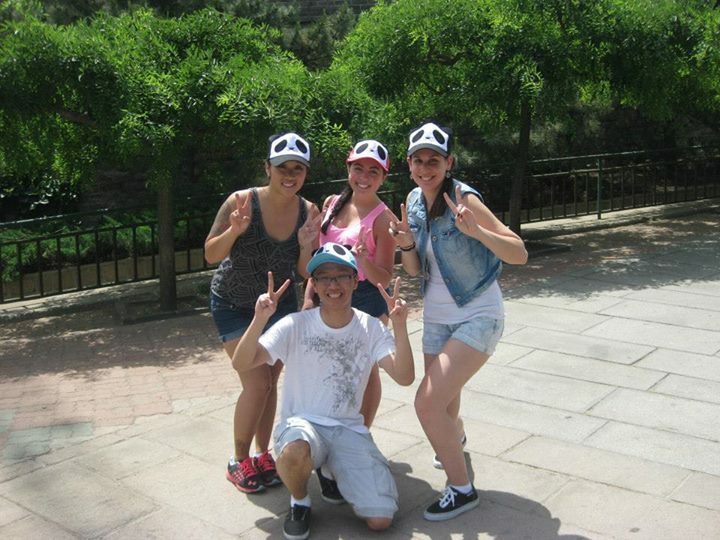 We bought cute panda hats in China that we found a week later for half the price. Save your money for one priceless gift for yourself. That’s not to say don’t buy yourself anything else the whole trip. However, study abroad trips leave lasting impressions. Having one precious item to take home from your adventure will mean a lot to you in years to come. 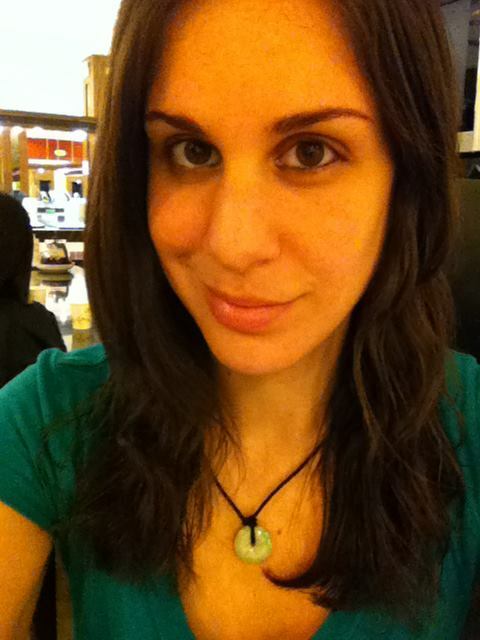 My favorite purchase of the trip: a Jade necklace. It’s very special and something I will treasure forever. Writer and traveler Deborah Cater once said, “You have to taste culture to understand it”—and she wasn’t wrong. When you go to a foreign country and choose to eat only foods you are familiar with then you’re doing yourself a disservice. Traveling is all about trying new things—and food is one of the most important ones. In China, there are so many unique local dishes to try so you shouldn’t let fear of the unknown get in the way of experiencing the country like the locals do. Sure we’ve all gone to our local Chinese takeout place and have ordered the pork Lo Mein or General Tso Chicken, but if you take the time to explore the country you’ll find non-Americanized Chinese food that’s definitely worth a try. One of the most popular dishes to try if you find yourself in Beijing is the Peking Duck. This famous dish has been prepared since the imperial era and is served with steamed pancakes and eaten with scallion, cucumber and sweet bean sauce. Traditionally the meat is sliced thin by the cook right in front of you, which is definitely fun to watch. Two of the most notable restaurants are Quanjude and Bianyifang in Beijing, China. 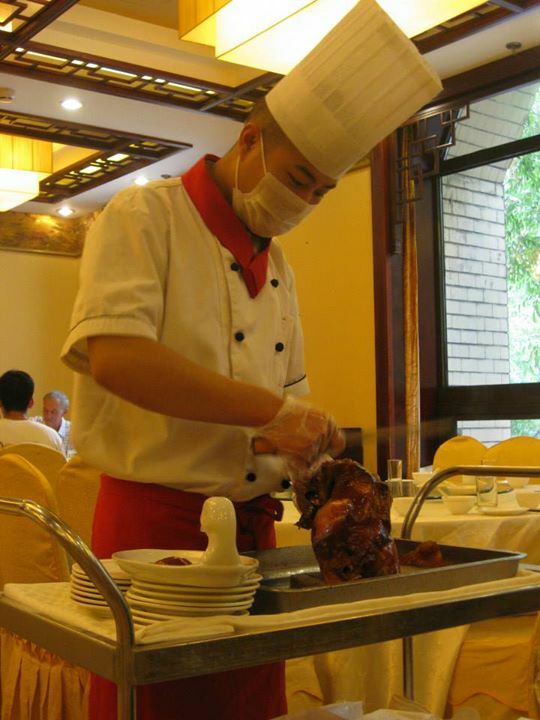 A chef prepares to carve a Peking Duck. 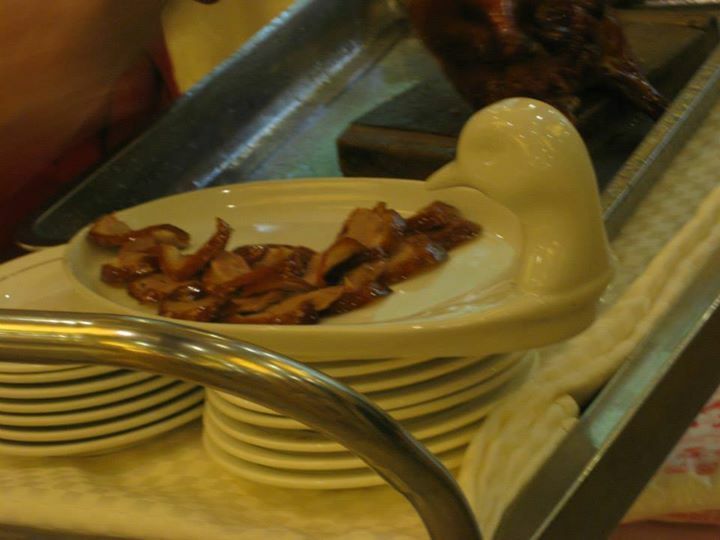 Peking Duck is traditionally served on a duck shaped plate. We all know that Italy is famous for their pasta; but did you know that the world’s oldest known noodles were actually discovered along the Yellow River in China? Dating back to roughly 4000 years BP, noodles have been a staple food in China—and watching hand pulled noodles being made is definitely something to go see if you visit. Hand pulled noodles, or Lamian, is made by stretching and folding the dough into strands. This unique method of making noodles originated in China and dates back to 1504. Lamian literally means pull or stretch, lā, (拉), noodle, miàn (麵) and watching a professional noodle chef pull noodles is a tourist attraction in itself! 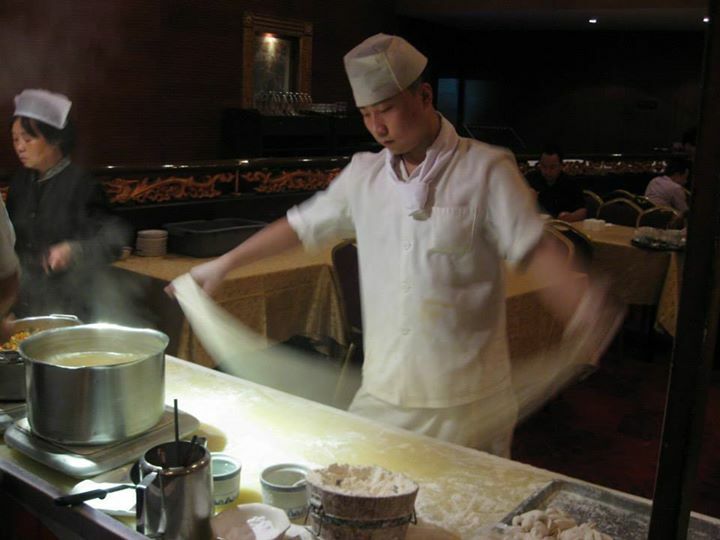 The process of preparing hand pulled noodles is so quick that it happens in a blur! Whether you’re traveling to China, or any other country, make sure that if you have food allergies you are well prepared. The chefs know what ingredients they use to prepare their food with and a language barrier shouldn’t stop you from being safe. Having a restaurant card is a great way to stay safe, and still be able to enjoy many of the delicious unique foods available. The card clearly states in another language the types of food you are not allowed to eat and your servers and chefs can take it from there. Also, take the time to find out if the water is safe to drink in your country of origin. Often times it’s just easier to choose to drink only bottled water for the duration of your stay. You know it’s clean and safe, and you definitely don’t want to get sick while studying abroad!